Bacterial cellular responses to metal ion stress are often measured as changes in transcription of genes involved in metal ion homeostasis, during detoxification processes or during functioning of efflux systems. Although there has been evidence for other bacterial cellular responses to metal ion stress, a view of what these responses are has been difficult to obtain. 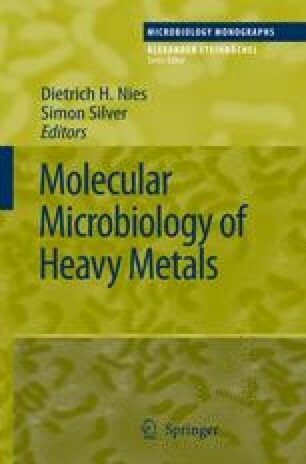 Recent measurements from genome-wide transcriptional profiling in bacteria strongly suggests that the effects of metals on cells may be very wide-ranging, and the transcriptomic responses equally wide. This chapter integrates the known biological effects of metal ion stress with data from microarray and other gene regulation studies from different bacteria responding to these stresses. Metal ion stresses elicit responses in metal ion homeostasis, oxidative stress responses, membrane stress responses, amino acid synthesis, and the expression of other metal ion import systems.